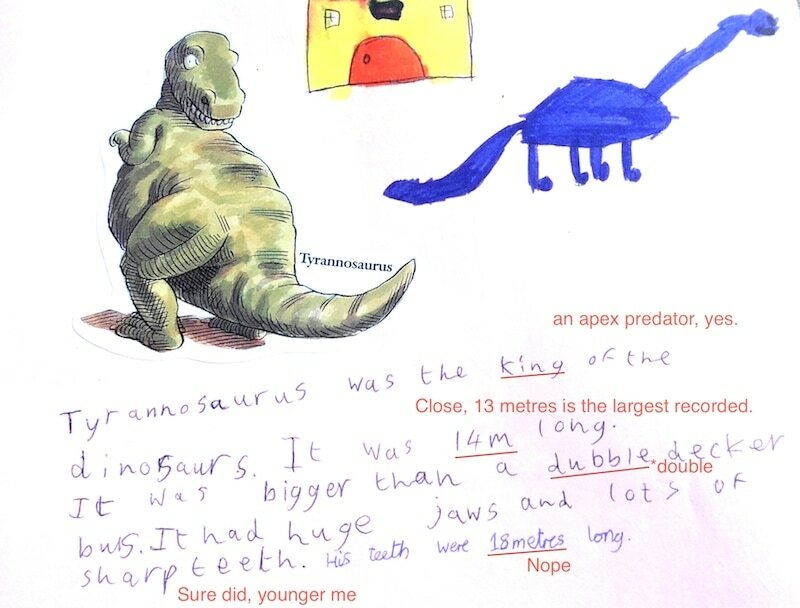 I started drawing and writing about dinosaurs as soon as I could hold a coloured pen or crayon. Here's Tyrannosaurus rex and a 2D Diplodocus outside my house in the early 90s. As my suggested edits show, my prose, spelling, and grasp of size needed some improvement. Today I continue to write about dinosaurs. And beavers, birds, coral, sharks, wildcats, lizards, and, well, pretty much anything from bacteria to bonobos. I focus on longform features in conservation, evolutionary biology, and human health. My words have appeared in Aeon, Nautilus, Hakai, PBS's NOVA Next, New Scientist, Mosaic, The Open Notebook, and the BBC. What happened in-between? After completing my master's in zoology from the University of Sheffield I embarked on a PhD in evolutionary development (evo-devo), but decided to throw myself overboard before the four years consumed me. Science is a rewarding, difficult, and beautiful occupation, but it wasn't for me. I was interested in the stories behind the science, the people, and how their personalities and lives reveal the hidden secrets around us. My first book, set to be published in 2020 by Scribner (Simon & Shuster) and Ebury (Penguin Random House), is a scientific journey into how we how we treat depression around the world. Depression is something that I'm very familiar with, but the book isn't just about me; it is not a memoir. It is a history of depression from around the world, how it manifests itself in different cultures and, most importantly, how we treat it. An estimated 350 million people suffer from depression and it is set to be the leading cause of disability bar none by 2020. The book will cover over 2000-years of human history, from the Ancient Greeks through the polymaths of Mesopotamia, and into the modern day of talking therapies, antidepressants, and electroconvulsive therapy. It is set to be published in Spring 2020. In late 2017, it was bought by Ebury (Penguin Random House) in the UK and Scribner (Simon & Shuster) in the US. I live in Bristol with my partner and our plants.